Kitchen Little - I'm The Chef Too! It’s time to cook with our favorite books! Join us as we have fun learning new recipes- varying from savory to sweet – inspired by our favorite storybook characters. 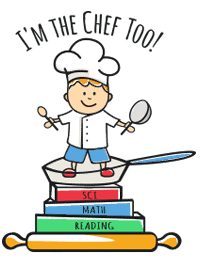 Little chefs will learn hands-on cooking techniques, try new delicious and nutritious ingredients, and get their hands dirty mixing, measuring, rolling, all while exploring their imagination!